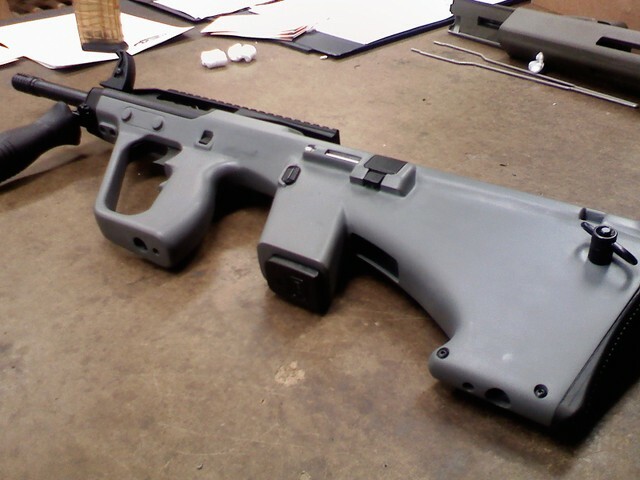 Microtech Small Arms Research (MSAR), manufacturers of a USA made AUG clone, announced this week they will no longer be in the business of manufacturing firearms. Their website is immediately clear of any links or information. It’s been quite the journey. We set out to share our passion for firearms with the industry and deliver an advanced, American-made bullpup rifle and accessories. Knowing that our focus and energy lately has been directed towards the expansion and evolution of our 20-year knife line, we no longer felt it sustainable for MSAR to remain an active entity in our holdings. That being said, we’ve begun to liquidate our remaining inventory. The existing inventory will be packaged into parts kits and sold on a limited basis. Contact and ordering information for those kits will be made available in the coming weeks. Repair services have been disabled with the release of this announcement. Rifles currently in our posession will be repaired and returned to the owners. As the MSAR project comes to a close, arrangements will also be made to offer purchase options for our existing tooling to qualified buyers. Parties who wish to have their interests considered should submit a formal request, including a letter detailing qualifications and a minimum of three (3) industry references to tooling@msarinc.com. Please note that we will not be responding to any service inquiries or general questions sent to this account. We learned many years ago that our customers are our lifeline; we thank you,, for your tireless loyalty and support of the MSAR line. You’ve given us the chance to explore the world of firearms on a new level, and for that, we’ll be forever grateful. Copyright © 2015 Microtech Knives, All rights reserved. Behind the scenes at MSAR in September 2012. Lets take a look at some of the firearms they made or had announced but never released. In 2012 I confirmed with MSAR this list of STG556 production rifles in chronological order. Along the way MSAR enjoyed many special editions. Limited editions often came in Pelican cases with Microtech knives, assorted magazines and in all matching colors. Static/water transfer printed camo patterns often came up from time to time. 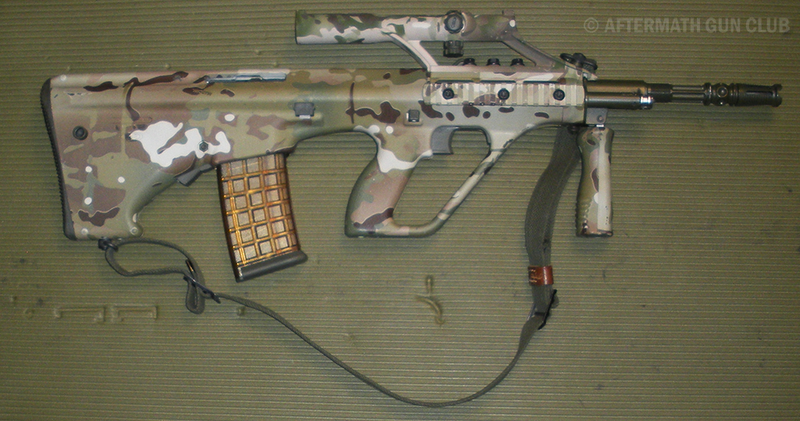 Below is a factory Gen.4 in Multicam with all metal parts painted green. For a short time, just before the bankruptcy, models were available in 7.62x39mm, 5.45x39mm, and 6.8 SPC. The Soviet caliber firearms had a lot of reported reliability problems. I’m sure some people will state they haven’t had issues, but the problems were related to the decision to not bring them back. The XM17-E4’s in 7.62x39mm are easily recognizable due to the dramatically curved magazines. About eight years ago large distributors started listing pistol caliber versions on their site, complete with MSRP. 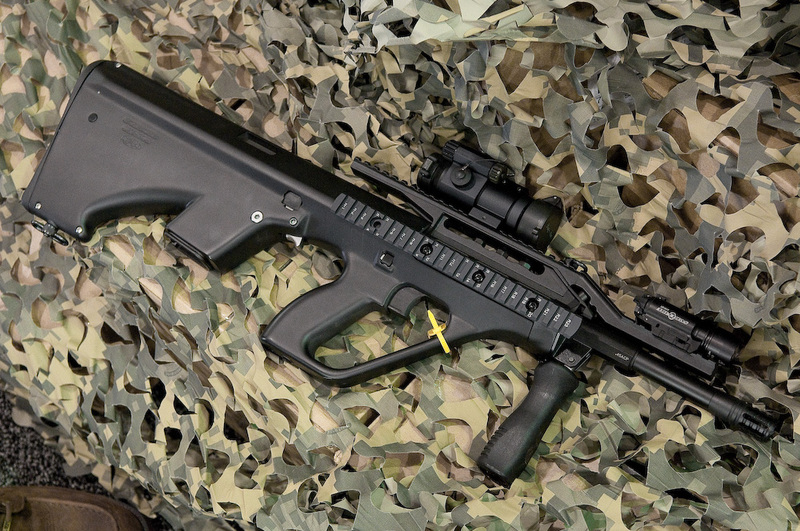 Their website displayed a banner for these sub-carbines from 2009 to 2011. For years distributors like RSR no longer list the MCS series, but some online retailers do. The firearm would have been available for around $1000. An amazing deal by today’s standards. 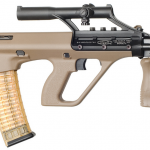 The sub-carbines were designed to accept Glock magazines in an integrated magwell, rather than using a magwell adapter in the fashion the Steyr AUG series does. However an adapter would be used to convert from one pistol caliber to another. 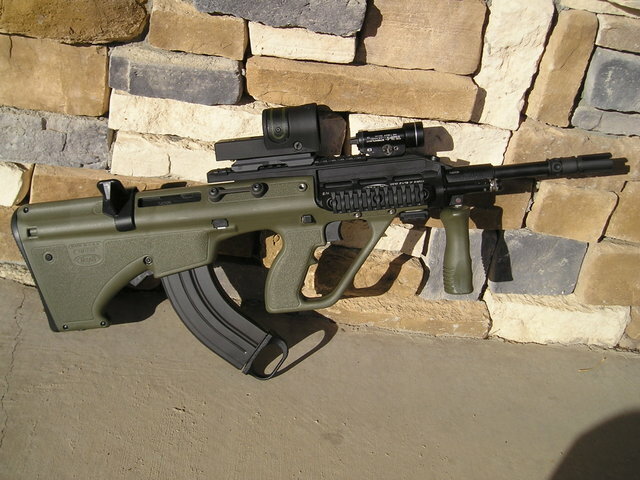 In the first photo above you can see the use of an adapter inserted before the magazine. Like magazine sizes, such as Glock 9mm and .40SW magazines would use the same block while 10mm and .45Auto would use another. Caliber conversions would be available and require only the changing of minimal parts, in most cases the barrel, bolt face, firing pin, magazine, and magazine adapter sleeve when applicable. 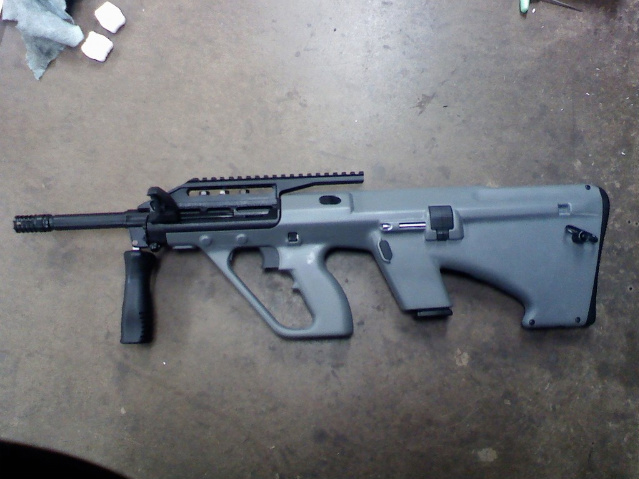 Although listed in 9mm as the MCS-08, early press labeled it the STG-9MM. Other calibers slated were in .40SW (MCS-40), 10mm (MCS-10), and .45. Below is a short clip of the MCS-45A in .45Auto/ACP (sn. MCS-XP0002), about this time the .45GAP caliber was still getting some press and so an MCS was planned to be available as the MCS-45G. I believe a Models with a rail rather coming from the facotry with the optic, were named with the R after, the MCS-08 becomes the MCS-08R, etc. A .357SIG version was planned but I couldn’t verify anywhere but some chatter on forums. 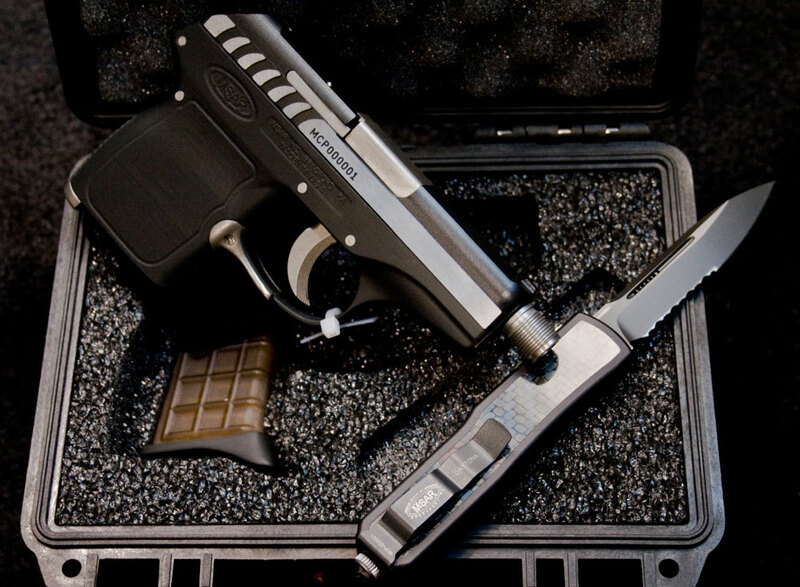 The Archangel pistol listed as an upcoming product on MSAR’s own website before they declared bankruptcy. When they returned in 2012, the pistol was forgotten. 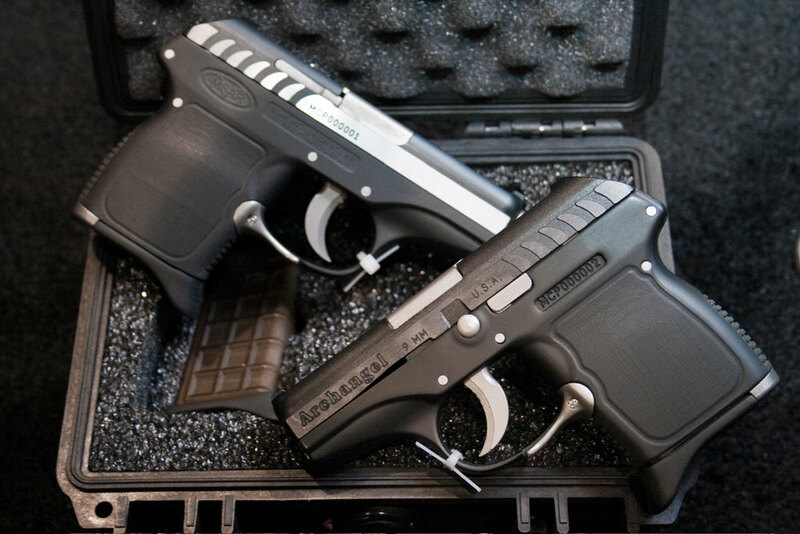 The shame in not seeing these, is that they would have come out just as the pocket pistol industry was about to increase significantly. I’d sat on the fence about picking up a .300 BLK conversion from them. I’d been hoping they’d return the 7.62x39mm and 5.45x39mm to their lineup, especially in the wake of IWI USA deciding to cancel the 5.45x39mm conversion for the Tavor SAR. 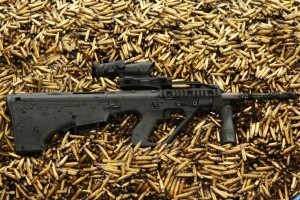 The Tavor .300 BLK won’t be quite as quick to swap barrels but has been a more reliable firearm from my experience. To any hoping for more calibers, as I had, keep watch on the new Desert Tech MDR series. Does anyone know if it’s true that they made a limited run of 32 All Stainles STG556? I met a dealer that has a 19 of 32 model and I am interested ut can’t find much info. Anyone? Cased and everything. I have not seen a stainless model but I would not be surprised if they did; MSAR did a lot of different limited runs. Does anyone know of a place to go, other than RAT Worx, to get replacement parts for the STG?